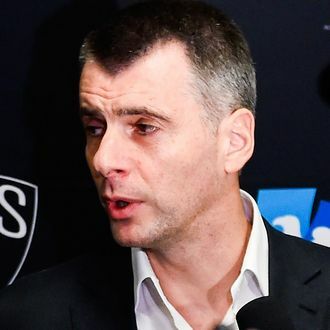 There’s been talk for some time that Nets owner Mikhail Prokhorov could be looking to sell at least a piece of his stake in the team, but he’s reportedly taken a step toward selling the whole thing. Via Bloomberg, Prokhorov has retained Evercore Partners to sell the Nets, but not his 45 percent stake in Barclays Center. Prokhorov owns 80 percent of the franchise, which is worth $1.3 billion according to one valuation, but could sell for even more, considering the $2 billion Steve Ballmer paid for the Los Angeles Clippers last year.